A brand new study out of the University of Alberta, in Canada, suggests that exposing very young children to pets, early in life, might improve their eventual health outcomes down the road. While some existing studies have certainly encouraged the adoption of pets to improve range of allergies, this new research says that the introduction of pets could also help some children avoid developing obesity later in life. The latest research shows that when babies are born to families who have pets, they grow to be healthier. For the study, the research team analyzed more than 700 people children in Canada. The team found that if a baby is exposed to pets even while in the womb (or within the first three months of birth) they have an “abundance” of ruminococcus and oscillospira bacteria in their physical makeup; the latter of which has been associated with leanness, lower body mass index. University of Alberta epidemiologist Anita Kozyrskyz led the team. She says that these two types of bacteria increase “twofold” when you introduce a pet to a household with a baby (or is expecting a baby). The research team intimates that, perhaps, this works because exposing a child to these bacteria allows them to develop resistance. Kozyrskyz notes that exposure to a pet can indirectly affect the microbiome of the gut: dog to mother to fetus. In addition, the study also found that when pets are present in the house, it results in a reduced the transmission of vaginal group B strep (GBS) during birth and that can will normally cause pneumonia in newborns. Indeed, the researchers suggest that it is widely believed that exposing a child to dirt and bacteria—just like the ones you might find on a household pooch—can simply produce early immunity. 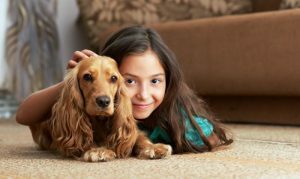 At the same time, though, they still need to conduct more research in order to completely understand the benefits of the bonding between a child and their canine pal. The results of this study has been published in the journal in Microbiome.